Commercial Real Estate Day offers real world experience. 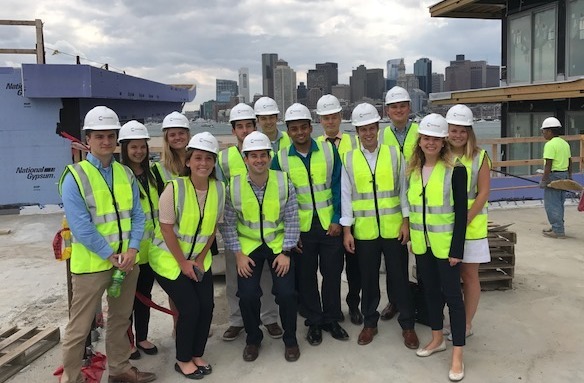 Colleagues in our Commercial Banker Development Program (CBDP) had an opportunity to gain real world exposure to commercial real estate during Citizens’ Commercial Real Estate Day. It’s one of several presentation days offered to CBDP associates to provide an in-depth look at different business areas support by our Commercial Banking team. The event began with a presentation on the business of commercial real estate, the variety of clients it supports and their unique portfolios. Associates received a behind the scenes look, learning about different types of loans, the due diligence process and the underwriting requirements used in this field. Commercial Real Estate Day concluded with an in-person site visit to an apartment complex in Boston, owned by one of our own customers. “Getting to see the properties was like putting a face to a name. In this case, it was putting an apartment complex to a loan”, recalls CBDP Associate, Aaron. The Commercial Real Estate team works with hundreds of developers and real estate investors, providing expert advice and customized solutions for our customers. Armed with knowledge of industry trends and market-specific economic and competitive conditions, they develop customized capital solutions to address an array of commercial real estate needs. CRE Day was a big hit offering the CBDP associates an immersive experience as part of an early career development program. Learn more about our Commercial Banker Development Program for recent grads and discover a career full of potential.